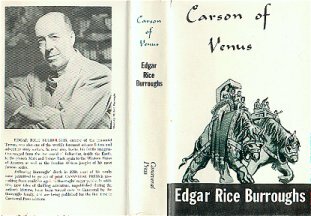 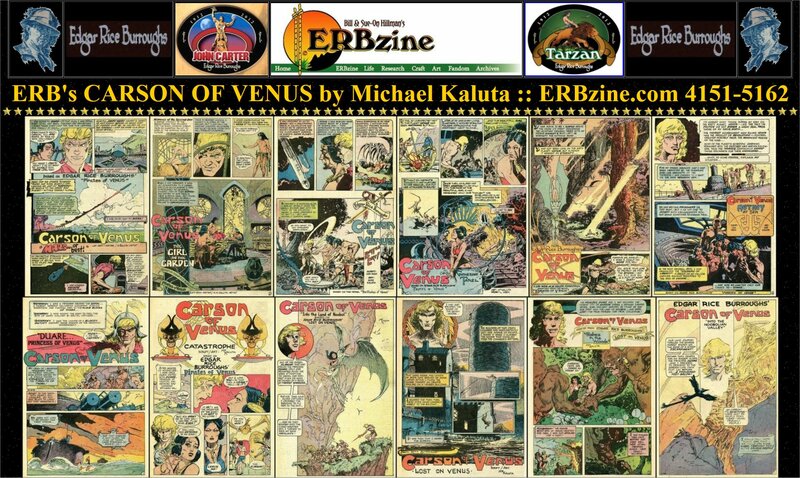 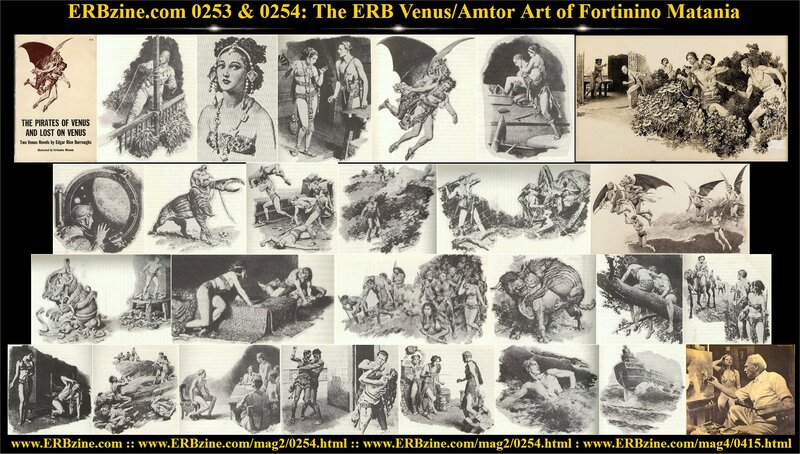 ERBzine 0750: Carson of Venus C.H.A.S.E.R. 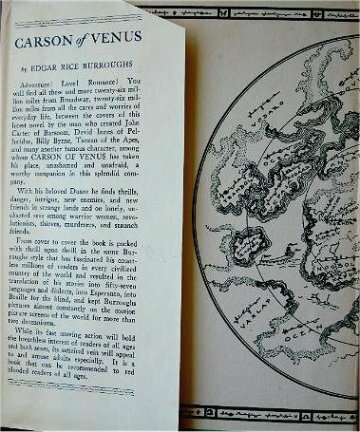 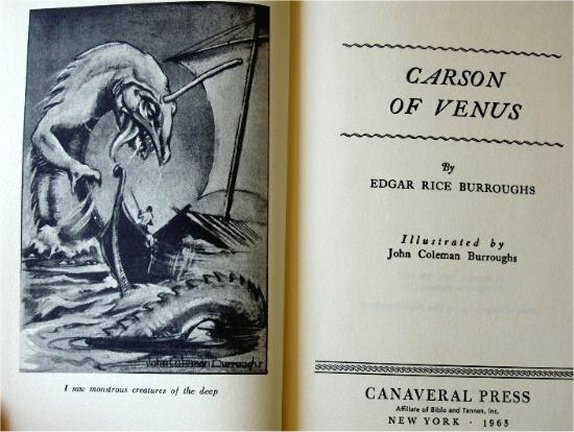 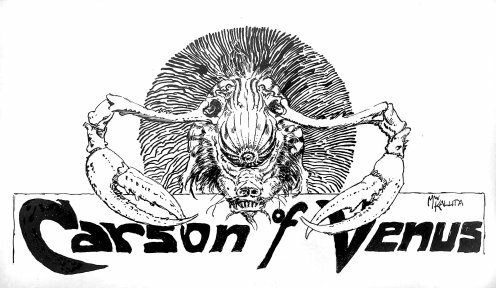 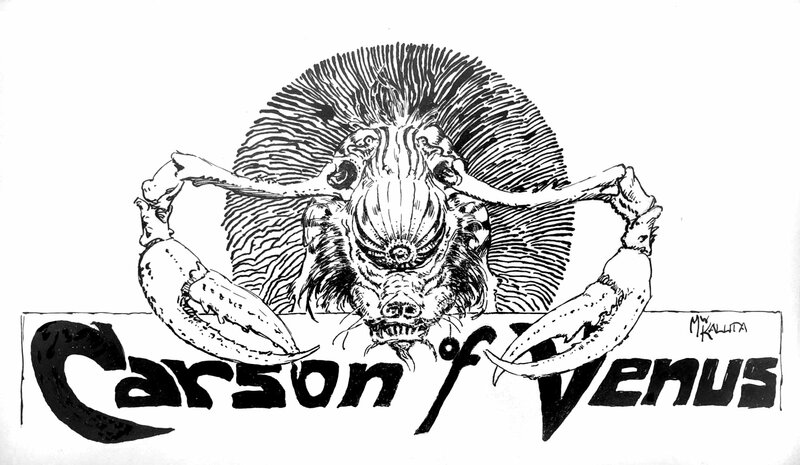 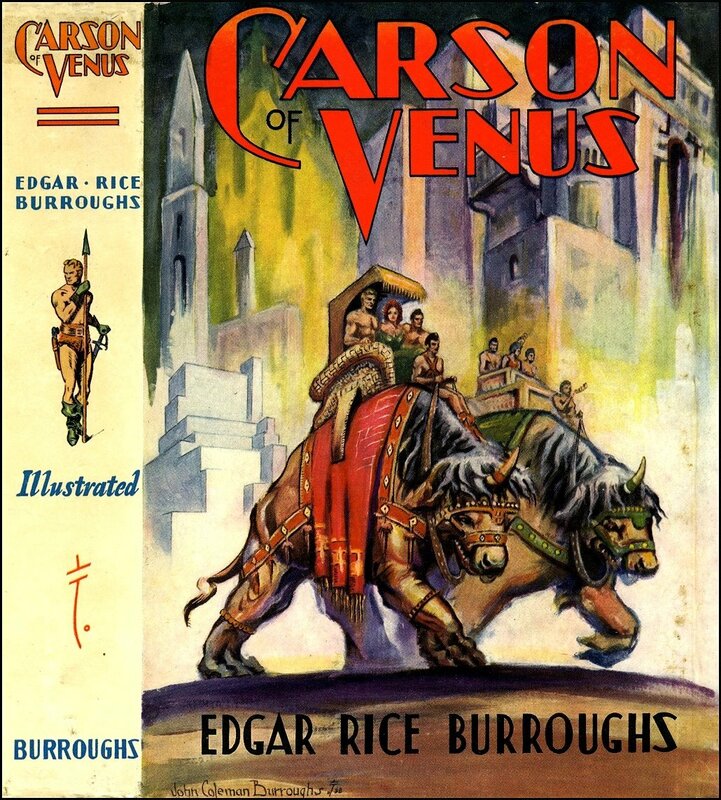 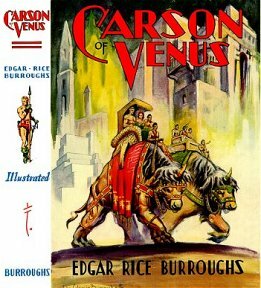 Carson of Venus On the mist-shrouded planet of Venus, advanced civilizations blessed with eternal youth co-existed with cities haunted by the living dead, while bloodthirsty man-beasts stalked the luminous nights. 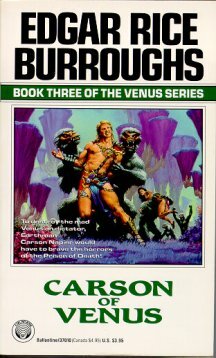 Earthman Carson Napier knew how to survive the planet's many perils-but now a merciless tribunal had condemned Carson's beloved princess Duare to death. 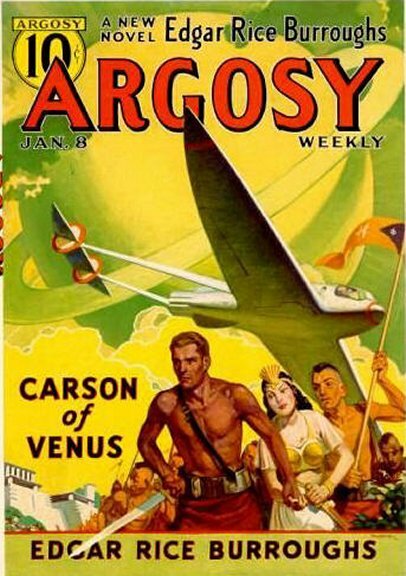 To save her life, the courageous Earth man stole the only airplane on Venus. 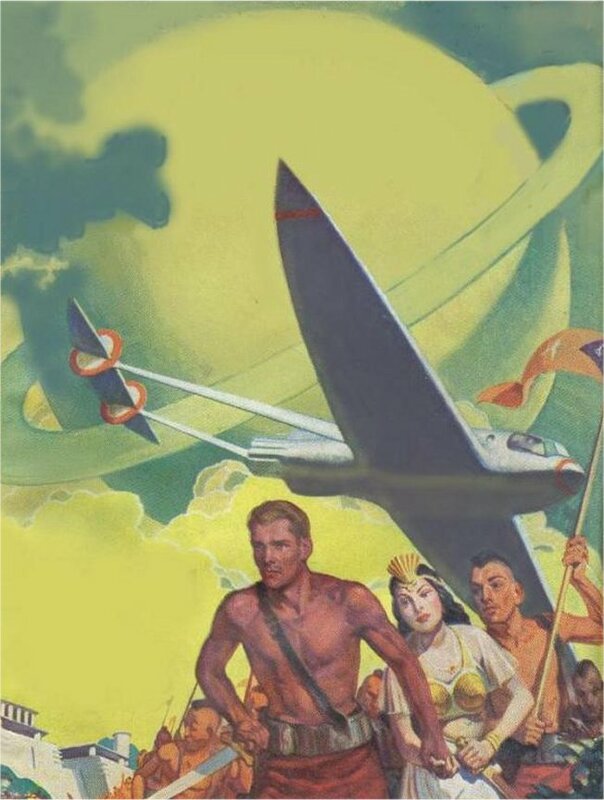 But on the lovers' flight to freedom, they learned that Duare's father had been captured by a mad dictator. 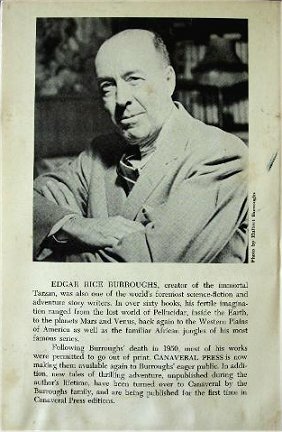 Foreword INDIA IS a world unto itself, apart in manners, customs, occultism from the world and life with which we are familiar. 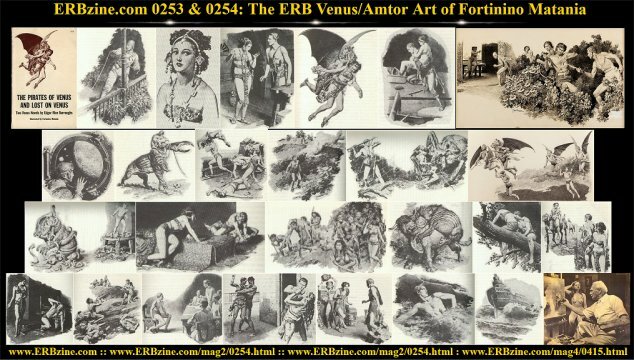 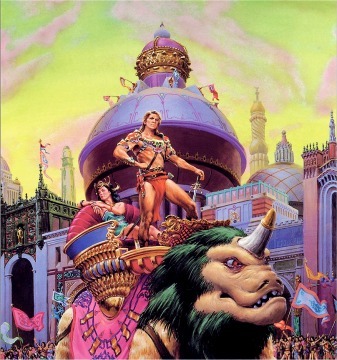 Even upon far Barsoom or Amtor might be found no more baffling mysteries than those which lie hidden in the secret places of the brains and lives of her people. 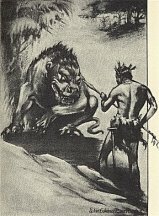 We sometimes feel that what we do not understand must be bad; that is our heritage from the ignorance and superstition of the painted savages from which we are descended. 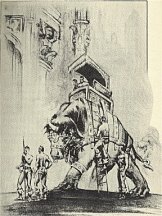 Of the many good things that have come to us out of India I am concerned at present with but one--the power which old Chand Kabi transmitted to the son of an English officer and his American wife to transmit his thoughts and visualizations to the mind of another at distances even as great as those which separate the planets. 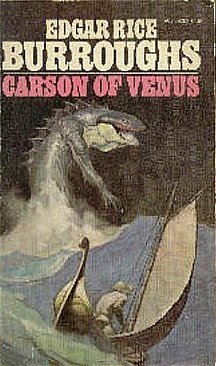 It is to this power we owe the fact that Carson Napier has been able to record, through me, the story of his adventures upon the planet Venus. 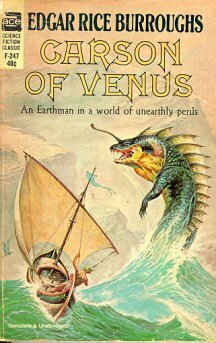 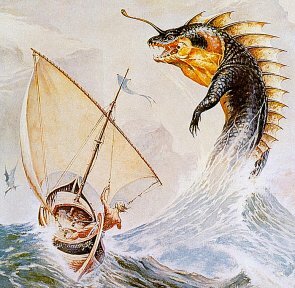 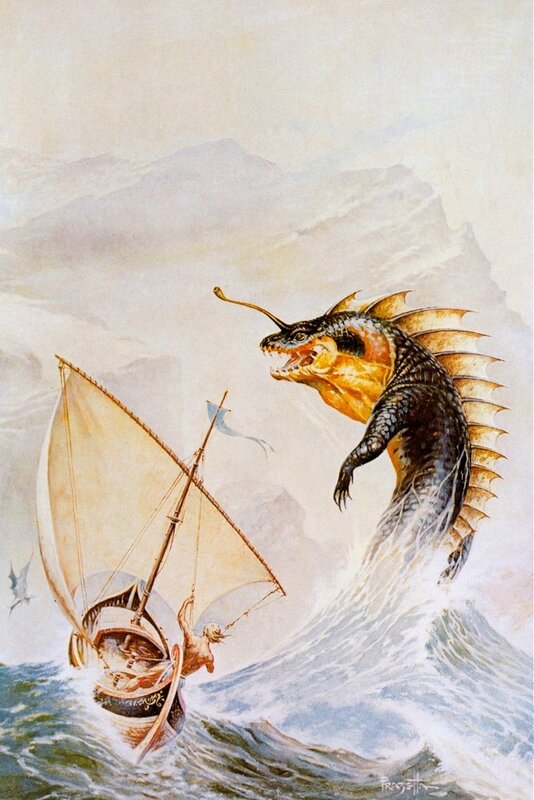 When he took off from Guadalupe Island in his giant rocket ship for Mars, I listened to the story of that epochal flight that ended, through an error in calculation, upon Venus. 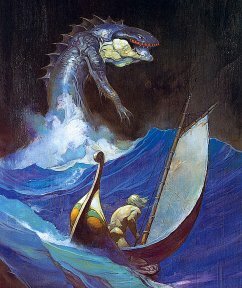 I followed his adventures there that started in the island kingdom of Vepaja where he fell desperately in love with Duare, the unattainable daughter of the king. 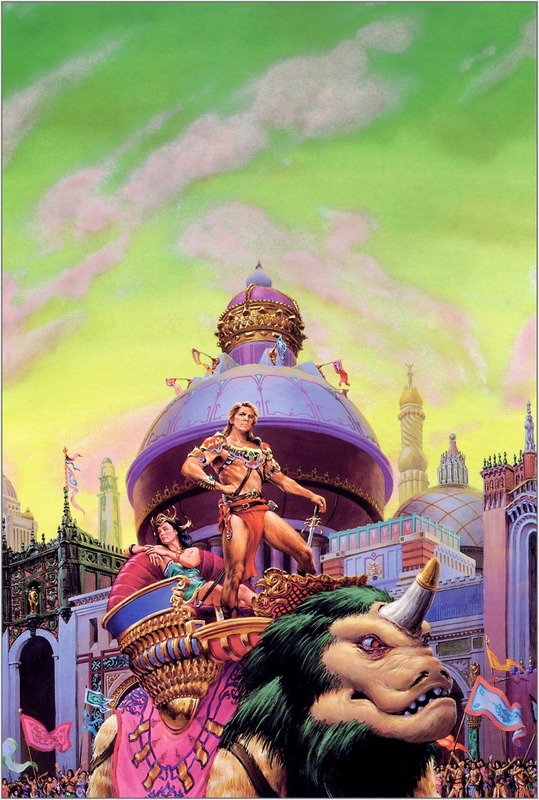 I followed their wanderings across seas and land masses into the hostile city of Kapdor, and Kormor, the city of the dead, to glorious Havatoo, where Duare was condemned to death through a strange miscarriage of justice. I thrilled with excitement during their perilous escape in the aeroplane that Carson Napier had built at the request of the rulers of Havatoo. 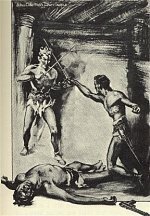 And always I suffered with Napier because of Duare's unalterable determination to look upon his love as an insult to the virgin daughter of the king of Vepaja. 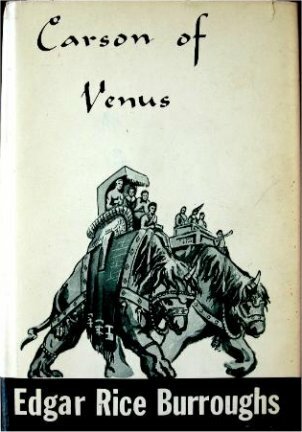 She repulsed him constantly because she was a princess, but in the end I rejoiced with him when she realized the truth and acknowledged that though she could not forget that she was a princess she had discovered that she was a woman first. 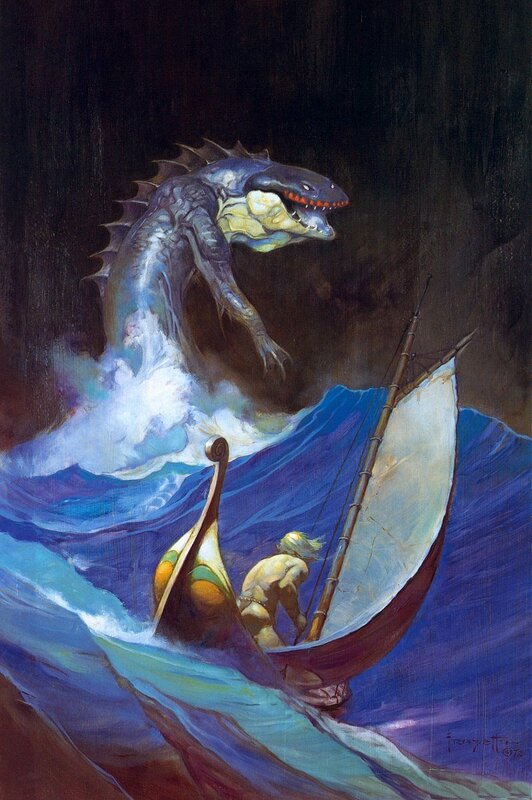 That was immediately after they had escaped from Havatoo and were winging their way above the River of Death toward an unknown sea in seemingly hopeless search for Vepaja, where Duare's father, Mintep, ruled. 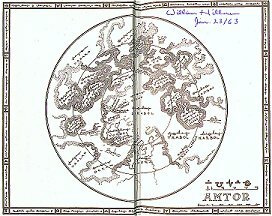 Months passed. 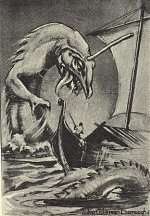 I commenced to fear that Napier had crashed in his new ship, and then I began to have messages from him again which I shall record for the benefit of posterity as nearly in his own words as I can recall them.